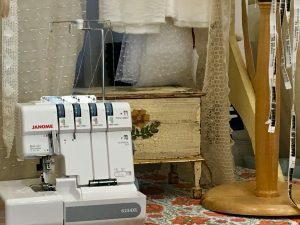 By popular demand, loving the fabric is happy to again be working with Tanya Hooper to offer a 2 hour course focused on using your overlocker. Tanya has worked as a representative for Elna and is also experienced with Bernina, Janome and Brother machines. In this workshop, Tanya will share her expertise with the features and options of overlockers. The cost for the course is £40. Students with their own overlockers should bring them and when booking it would be helpful to let us know the brand name and model. For more information or to reserve your spot, please call Gay ((0)20 8332 6031 ) or stop in the shop.